Crystal Runner is a non-trivial mix of old school classic gameplay arcade game created and developed by qdrj. This flash game offers beautiful graphics, neat design and easy controls. If you love old games like pacman and bomberman, chances are you will like this one too. Tips and tricks: As you go further in the game, you will encounter black holes that will start to chase you if you get in their line of sight. Simply try to weasel to escape from them or go inside the castle where these pesky holes can't come in. Or just outrun them for you run faster than them and even faster than its orbs. 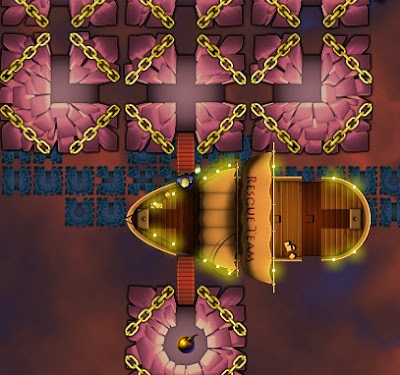 Also take advantage of the zoom out button to see all the locations of the coins, bombs, enemies and the ship. With that you can easily plan your route and strategy. Meanwhile, here is a short gameplay video whilst we try to find a full Crystal Runner walkthrough. The sun’s ultraviolet rays are most damaging between 10am and 2pm. Even under overcast skies, we should protect our eyes, as the rays of the sun do pass through clouds. And when under a shade, we should still wear sunglasses, because UV rays are reflected by sand and water. Awesome looking. I am astonished.